Blog from Aukland, New Zealand | V - a long way from home! Well I made it to Aukland the capital of New Zealand. I´m told that the views on the bus journey up from Brian and Liz´s were gorgeous but I have to confess I slept all the way so I wouldn´t know! I´m staying at family over here in Aukland. Mum´s cousins who have lived here for ages and whom she hadn´t seen for 40 years until her and dad came here on their holiday last year. Andrew and Norma had a lot to live up to after having Brian and Liz as hosts but I´m glad to say they lived up to the challenge. On my first afternoon we headed 2 minutes up the road to Devenport which is a pretty part of Aukland on the North side of the bridge. 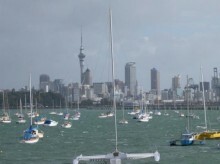 For those of you who don´t know, Aukland is quite like Sydney with the harbour, the bridge and the tower. It just doesn´t have the opera house. Davenport reminded me a little bit of Manly where I stayed in Sydney. 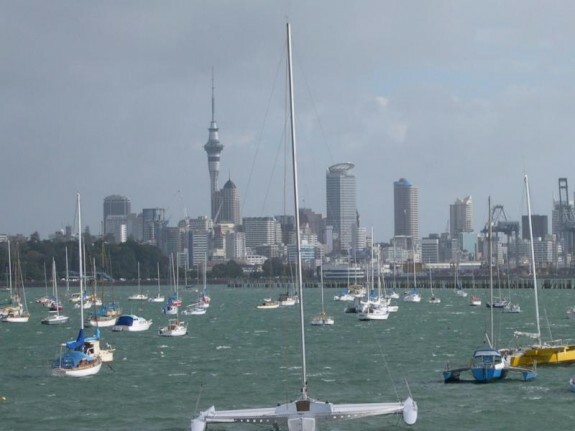 It´s on the north side of Aukland, you get the ferry to it and it has it´s own little community feel to it. It´s maybe just not quite as glamorous. Some might say that´s a good thing. We went up North Head and Mt Victoria both of which give you a birds eye view of Aukland. It was a nice sunny day and you could see for miles. It was great. Afterwards we went for a visit to see my Great Auntie Ruby and her son Colin. Ruby is great at the grand old age of 87. We had a good old chat about my travels and reminissed about Edinburgh and how we miss it (she´s clearly been away longer than i have but it´s starting to feel a while ago now). The following day Andrew and Norma took me on a drive to Muriwai. It´s a gorgeous beach which has next to it a Gannet colony. I had heard of gannets only once before and that´s when dad told me I was a greedy gannet when i was wee. I hadn´t ever seen them or smelt them before. I can now confirm that they are gorgeous, if somewhat smelly birds. I couldn´t tell whether the phrase eat like a gannet is fair because they weren´t eating when i was there. Andrew, Norma and I did however have a nice picnic in a sunny spot away from the smell of the bird pooh!! That night I went out with Andrew and Norma´s daughter Gillian (second cousin) and her friend Andrea. We went for a couple of drinks in Devenport where we bumped into another second cousin of mine who i´d never met before, Donna. We had a good old chat over a few drinks before heading onto Takapuna for a bit more lively nightlife. We got it in the form of live music in the Copper Room. Loved it!! On the Saturday I met up with Katie Reece an old friend (no offence intended Katie) from Edinburgh. We headed into the city on the boat in the afternoon and took a few compulsory photos of the waterfront and the Aukland skyline. We went for a wander around the city for a bit before we got a bus to a festival called Pacifica. It´s a festival which celebrates all the cultures of the Islanders in the Pacific. Katie and I had a nice wander round, listening to music, seeing their colourful dress and best of all tasting their food. That lined our tummies nicely for a night out on the town that night. We ended up heading into the city with Katie´s flatmate Mark and a few of his friends who were all pilots. Makes a change to going out with accountants all the time!! The nightlife in Aukland is good and we had a great night. Mega plus Aukland has compared to Edinburgh is that you get a taxi home so easily - none of this wandering way out to Haymarket before you manage to stop one. On the Sunday Andrew and Norma kindly hosted a family BBQ so that i had the chance to meet the rest of the family. Although the sun wasn´t out shining for it, I still had a great time. Thanks A&N. Monday 12 March was my last day in Aukland. In preparation for heading to South America I went out to do some shopping!! It had to be done. So I´m getting ready to venture onto SA now. It´s sad because i fell like that is another leg of my journey come to an end. I´d love to stay in NZ longer but I think I´ve said that about nearly everywhere i´ve been now. I´m sure i´ll come back at some point though. Thanks to Brian, Liz, Andrew and Norma for putting me up when i was in NZ. I really enjoyed myself and appreciate your kind hospitality. Better get going. Will speak to you all from South America.